In 1974, Yamaha introduced the world to the joys of single-shock suspension. Using a design pioneered by Belgian engineer Lucien Tilkens, the new Yamaha “monoshock” delivered twice the travel of traditional dual-shock systems and kicked off a suspension revolution. While the monoshock was indeed revolutionary, it was not without its flaws. In order to deliver its increased travel, the original mono employed a large single damper that was laid down and enclosed in the frame’s main backbone. Because of this location, early YZs felt top-heavy and tended to pitch violently in the rough (Yamahop) as the energy of the rear wheel was transmitted directly to the steering stem. These early monoshocks also suffered from chronic fading, as it was all-but-impossible to get any cooling air to the shock with it buried deep inside the frame and bodywork. In 1980, Kawasaki became the first manufacturer to offer a linkage-equipped single shock suspension to the public. 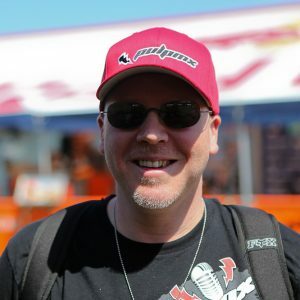 Shortly after the introduction of the Yamaha monoshock, the rest of the industry realized that there was indeed something to this long-travel business. By increasing travel, bumps could be hit faster and jumps could be launched farther. In order to compete, the other guys started laying down their shocks to increase travel. By rotating the shocks forward, the other manufacturers were able to match the Yamaha’s travel, without suffering the YZ’s packaging and handling issues. By the end of the decade, the suspension revolution had led to huge increases in travel across the board. Nearly every bike from 125cc to 500cc offered a full foot of travel front and rear. 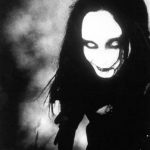 With everyone in agreement that this was probably the outer limit to what was practical, the next step was to find a way to make all that travel more effective. In the early eighties, all the manufacturers had very different takes on the optimal design for single-shock rear suspension. Kawasaki’s version used a set of pull-rods connected to a large rocker arm above the shock. Kawasaki would continue to use a version of this design until switching to a bottom-link setup similar to the Honda Pro-Link on the KX125 in 1986. 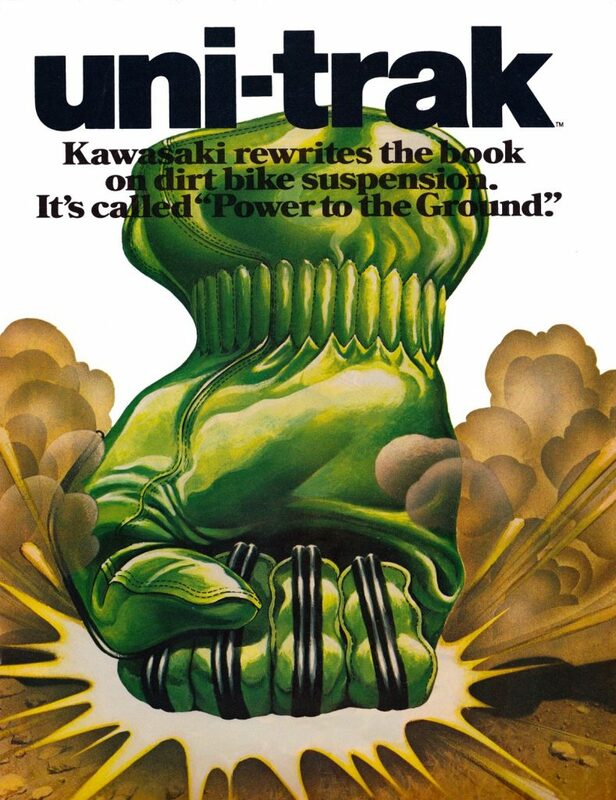 In 1980, Kawasaki took the next big step toward improving rear suspension action by ditching the dual shocks on their KX125 and introducing an all-new type of rear suspension design they dubbed the “Uni-Trak.” Originally just called just “Bell Crank”(catchy, huh? ), this new suspension design consisted of a large single damper, a bell crank (hence the name) rocker arm and a set of pull rods. Unlike the Yamaha monoshock, the new Kawasaki version placed its damper in a vertical position behind the airbox. This lowered the bike’s center of gravity and improved handling by doing away with the fore-aft pitching of the Yamaha design. While much of the advantage of a modern linkage suspension system is found in the progression of its linkage curve, this first design actually did without any sort of rising-rate at all. Originally, it had been Kawasaki’s idea to build a progressive curve into the design, but patent issues before its release prevented this important innovation from making its way to the 1980 models. 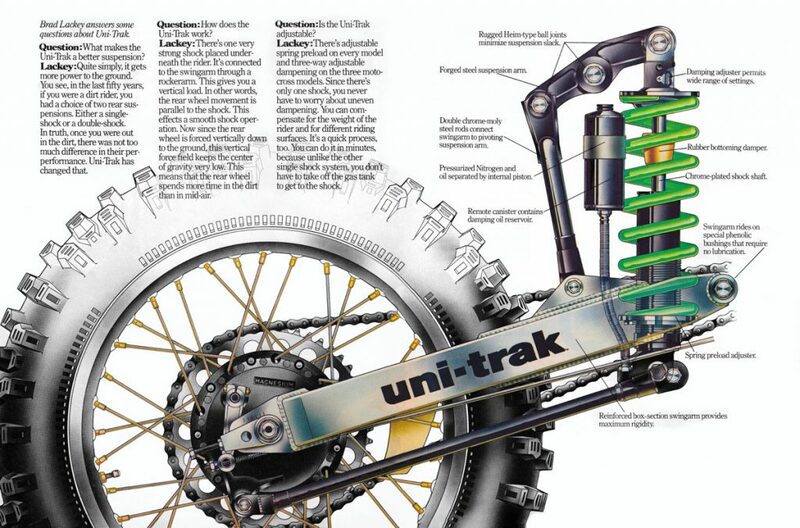 This meant that the new Uni-Trak was groundbreaking in many ways, but actually less progressive in action than the dual-shock systems of the competition. In spite of this technical setback, however, the new system was applauded for its innovation and desired for its works-like cachet. 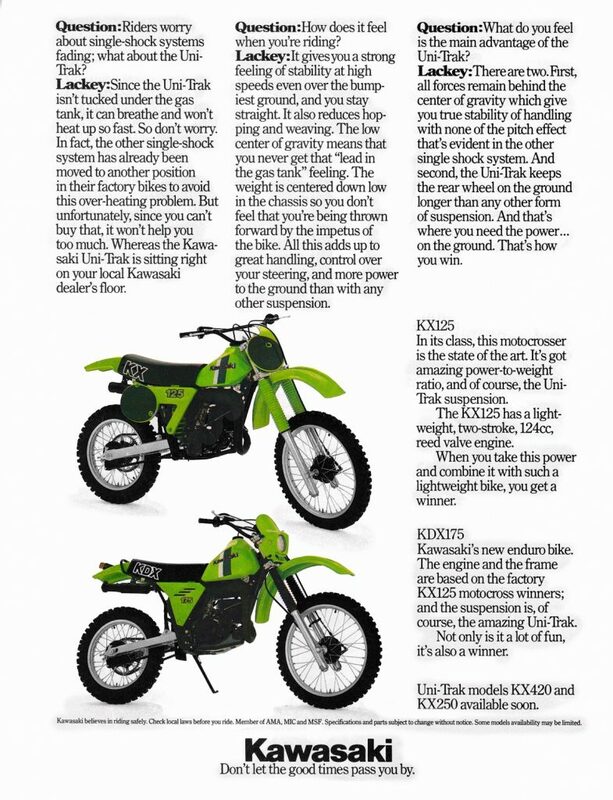 The first models to adopt the new Uni-Trak were the KX125 and KDX175. By 1981, all four manufacturers had switched to single-shock suspensions, and by 1982, even Yamaha had grafted on a rising-rate linkage to its mono. 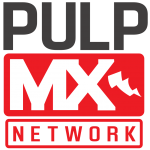 With tracks getting more technical and jumps becoming larger and more prevalent, it was clear that the future of motocross suspension was a linkage. In 1980, Kawasaki blazed a trail that all others were soon to follow and showed the world that Team Green was no longer content to be a bit player in the world of motocross.